On June 26, 2013 the JPO announced a revision of the examination standard regarding “unity of the invention” and “amendments that shift of special technical features of the invention”. The revision will be applied to all applications examined from July 01 of the same year. As this revision relaxed the examination standard filing in Japan has become more convenient for applicants. In the newsletter of July we already explained about the relaxation of the requirements for unity of the invention. In the Japanese patent law it is defined that an amendment that shifts the special technical features of an invention is forbidden. This regulation extends the requirements for unity of the invention towards the scope of the claims after an amendment has been filed. （Article 17-2 (4)）In addition to the case provided in the preceding paragraph, where any amendment of the scope of claims is made in the cases listed in the items of paragraph (1), the invention for which determination on its patentability is stated in the notice of reasons for refusal received prior to making the amendment and the invention constituted by the matters described in the amended scope of claims shall be of a group of inventions recognized as fulfilling the requirements of unity of invention set forth in Article 37. The point of this regulation is that, if after issuance of an office action amendments that would exceed the requirements for unity were allowed, the previous examination results could not be used and the examination would have to be carried out again. This would be an obstacle for fast examination. The regulation for such amendments has also been relaxed in accordance to the relaxation of the requirements for unity of the invention. Concretely, assuming that with the amendment new claims are added, the requirements for unity of the invention will be judged as if the new claims had been part of the original claims. There are 4 important points regarding the unity of the invention. Before the revision, (A) inventions including all matters specifying the invention of the claim where STF were found first would be subject of examination. In addition to that now (B) inventions that have the same or corresponding STF to the invention where STF were found first will be subject of examination as well. Also now (C) inventions including all matters specifying the invention in claim 1 (inventions depending on claim 1) will be examined. However inventions with only little relevance will be excluded. Finally as before (D) inventions that have been examined until STF were found first and where the examination has been substantially finished fulfil the requirements for unity. 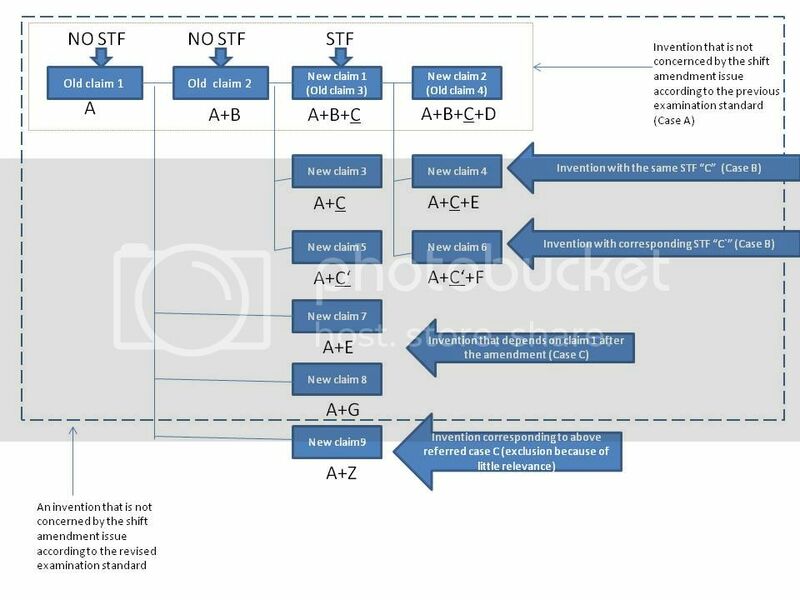 The figure below explains the revision of the examination standard regarding amendments that shift the STF of an invention. If in an office action claim 1 and 2 were objected because of lack of novelty, it can be considered to delete these claims. The STF first found are C. New claims 1 and 2 are accepted as before according to case A described above. New claims 3, 4, 5 and 6 are corresponding to case B described above. New claims 7 and 8 are corresponding to case C. By the way new claim 9 might be corresponding to case D, but if it is only of small relevance to claim 1 it will not be examined.